BOYNECLARKE LLP congratulates Breathing Space Yoga Studio on opening its new location in Clayton Park. Founded by Yoga Therapist and Ayuvedic Instructor Jenny Kierstead, Breathing Space Yoga Studio currently has studio locations in Bedford, Halifax, Tantallon, Truro, and Windsor. They are holding their Grand Opening for their Clayton Park location October 17-20, 2014. Owned by Carrie Meagher, the new Clayton Park location marks the sixth location within Nova Scotia. Breathing Space focuses on providing the best yoga courses within the communities in which they serve and has a goal of improving well being and emotional wholeness. Their mission is to help people awaken the extraordinary and become fully alive human beings. 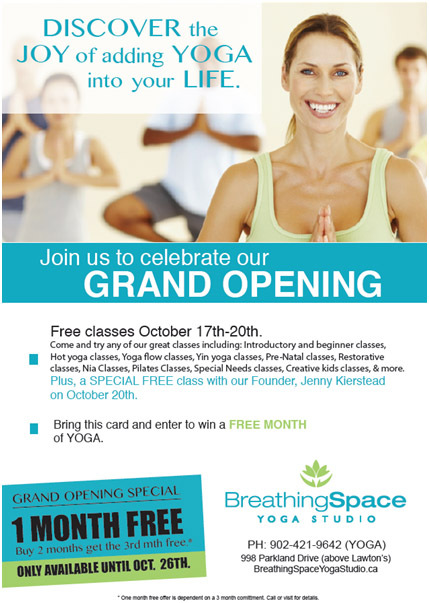 Congratulations to Carrie and Breathing Space Yoga Studio on your Grand Opening!